I was googling around for no carve pumpkin ideas when I found this big fella. It's so strangely realistic, I can hardly tear myself away from it's penetrating gaze. I'm super impressed, though I must admit, I'd rather kiss Han than this Wookie any day. 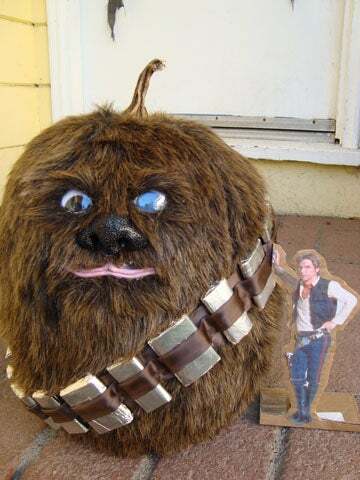 Chewie was created by Jennifer and Rafael Isaacs using a real pumpkin, faux fur, sculpting clay, ribbon, googley eyes, cardboard, foil, and hot glue. It required a heck of a lot more effort than I've ever been willing to put into a jack-o-lantern. You can read more about it here.